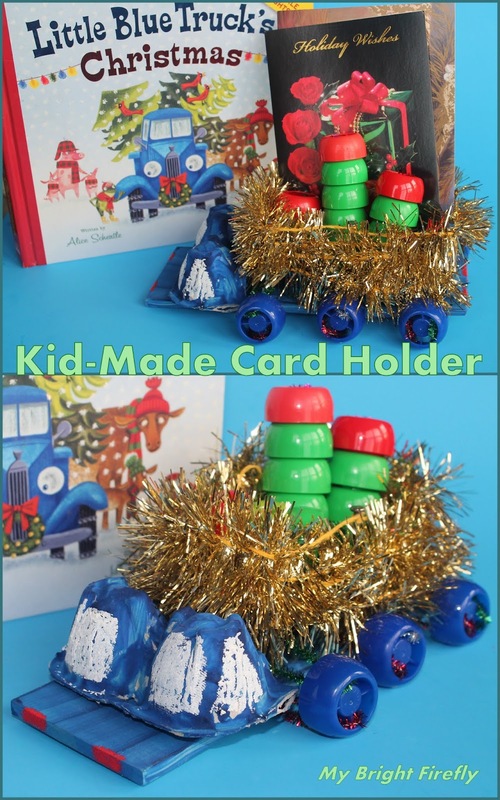 Little Blue Truck never fails to be an exciting craft project for kids! We made Little Blue Christmas card holder. Our first experience with hammering nails into the board went well. According to the book, Little Blue delivers Christmas trees to all his animal friends. Ours is also handy for displaying Christmas cards. All children are different and accidents happen. As usual, please consider safety first when choosing activities for your child. egg carton for the cab. The first real hammering experience for a 4 years old: I was holding a nail - she was scared. We held the hammer together, but I tried to let her apply the force. Review the safety rules before this activity, and consider your child's skill level when offering assistance. Pictured above, mark the spots for nails with a pencil, drive 6 nails into the board, cut a side off the egg carton, paint everything blue, let the paint dry. Pictured below, make wheels. Thread chenille stems through the holes in the caps as pictured, connect the ends and twist them together. We used 2 stems per a pair of wheels. When the paint is dry, assemble the truck. Thread the wheels through the board. Wrap the Christmas garland around the nails to form the truck's bed. Glue the cab onto the board. Paint white windows and red lights. We used oil pastels for coloring the details. My Firefly also made Christmas trees (there should be five according to the book). She simply stuck green caps with the red on top for the star and thread a chenille stem through them. I bent the stem and thread the caps in the opposite direction, twisted the ends together. Dramatic play: the trees are of different sizes for different animals. We played with the rhymes while delivering trees to Little Blue's friends. It was a nice practice for counting the caps and comparing the lengths of the trees. Glitter Glue Gingerbread Man Decoration from Adventures of Adam. Merry and bright: this gingerbread man looks so happy - we will have to make this Christmas decoration! Gingerbread House Photo Frame Ornament from Teach Me Mommy. The tradition of adding a new photo frame Christmas decoration each year is lovely! Such a wonderful way to collect family memories! Crystal Snowballs from Rainy Day Mum. These white sparkly balls are so neat! Kid Made Pom Pom Garland from Spark and Pook. That's a lovely Christmas garland a 3 year old can make - a great idea for the homemade holiday décor! Easy Cinnamon Scented Sled For Winter Décor from Play Dough and Popsicles. Can you smell Christmas in the air? This simple sled craft will add a scent of cinnamon sticks, and looks cute! Tissue Paper Christmas Wreath from 3 Dinosaurs. 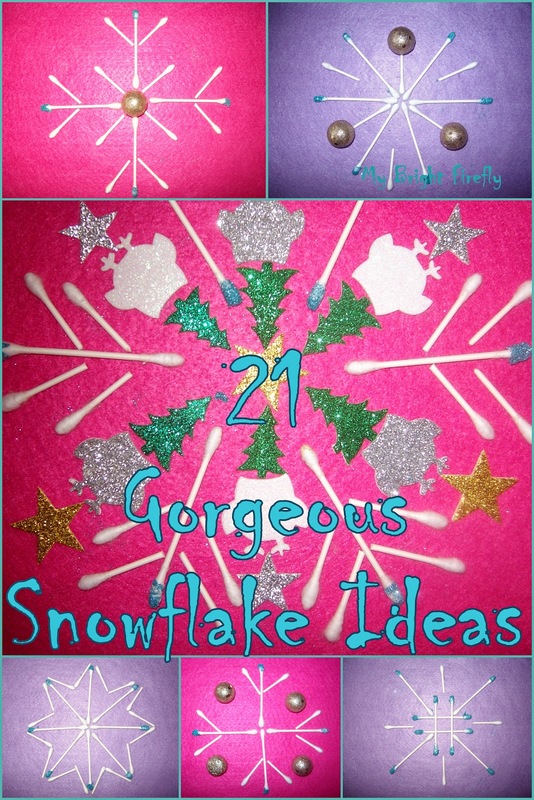 Kids can complete (and enjoy) this simple, but festive Christmas decoration all by themselves. Jolly Kid Made Salt Dough Christmas Ornament Garland from Crafty Mama in Me. The perfect idea of displaying fragile kid-made ornaments. Fine Motor Egg Carton Snowman Craft from Sugar Aunts. Poke holes in the Styrofoam egg carton and stack the snowballs together. Such a fun and pretty Christmas decoration! Simple Bubble Wrap Holly Wreath Decorations from Crafty Kids at Home. Paint a Christmas wreath using a piece of bubble wrap: a neat effect of evergreens kids will love! Gingerbread Man Paper Doll Decorations from Creative Family Fun. Lots of fun with paper dolls with the Christmas twist. Kids’ Art into Christmas Decoration from Non Toy Gifts. A wonderful festive way to preserve and display the precious art.